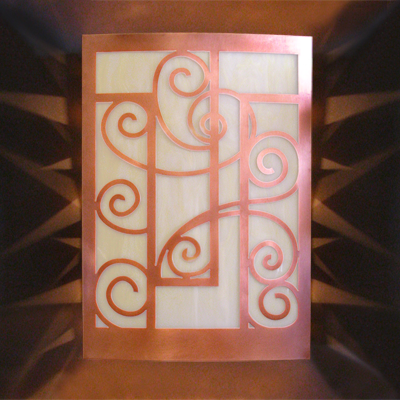 Custom copper wall sconce, created from the design on the customer’s garden gate. 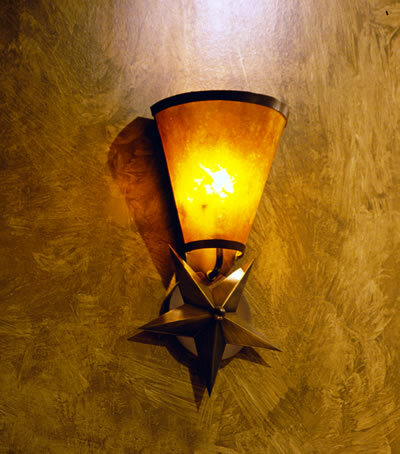 This handcrafted wall sconce presents the five pointed star as the prominent feature making use of the natural value contrast created with the translucent diffuser versus the opaque metal enclosure. 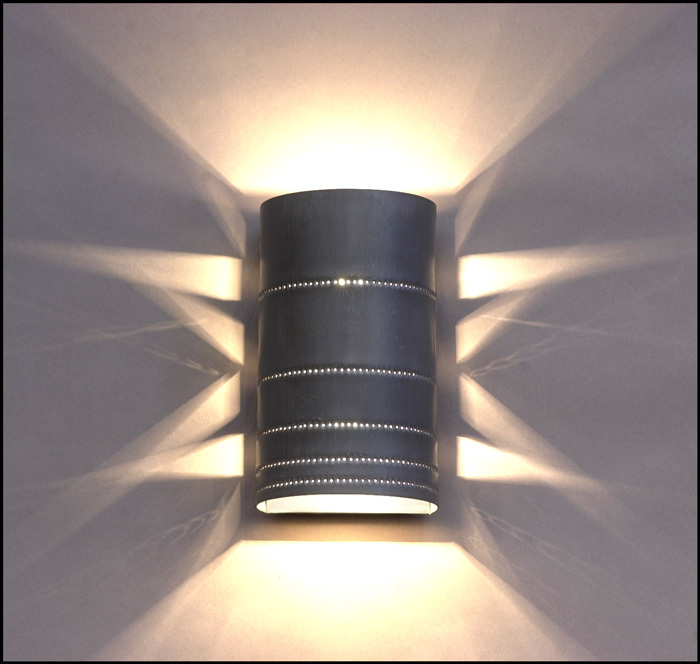 This handcrafted sconce presents the five pointed star as the prominent feature making use of the natural value contrast created with the translucent diffuser versus the opaque metal enclosure. 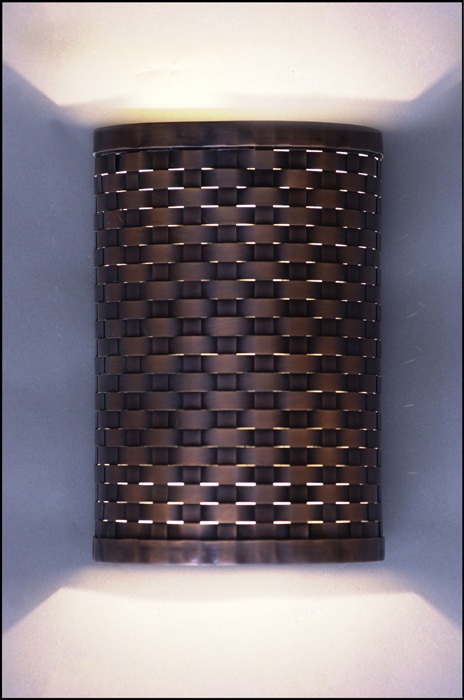 Hand woven copper wall sconce. 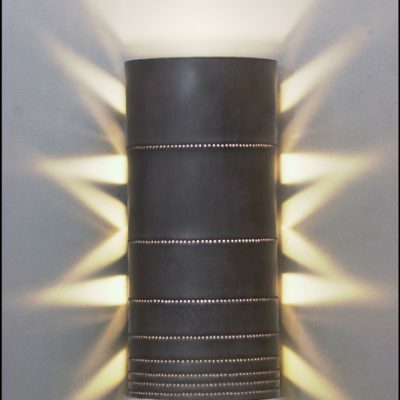 Originally designed for use in the horizontal position over a lavatory mirror, this piece can be oriented vertically for a totally different looking wall sconce. 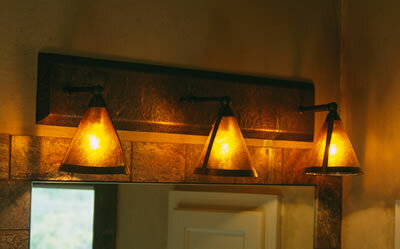 Wall fixture originally designed for use in the horizontal position over a lavatory mirror wall sconce, this copper lighting piece can be oriented vertically for a totally different look. 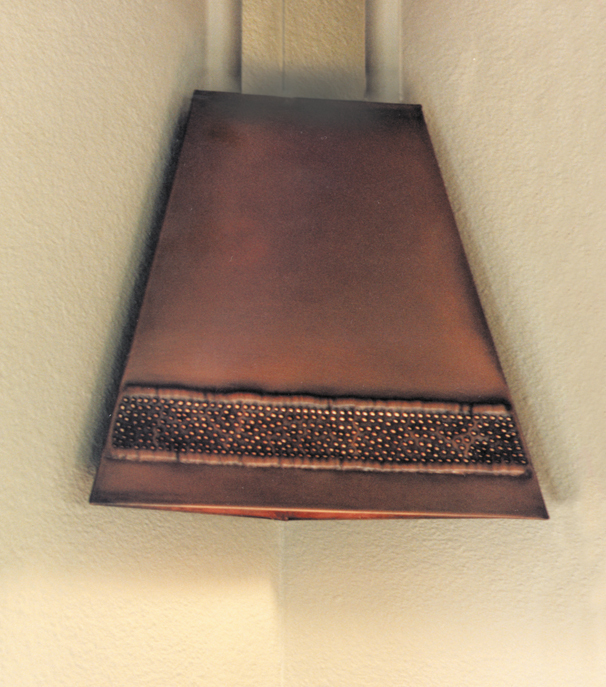 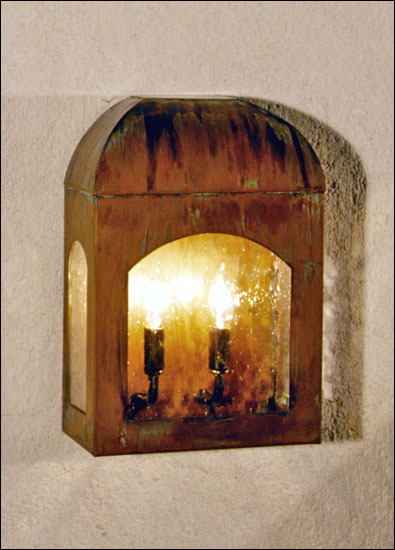 This copper wall sconce is intended to provide a subtly southwestern feel for any number of settings. 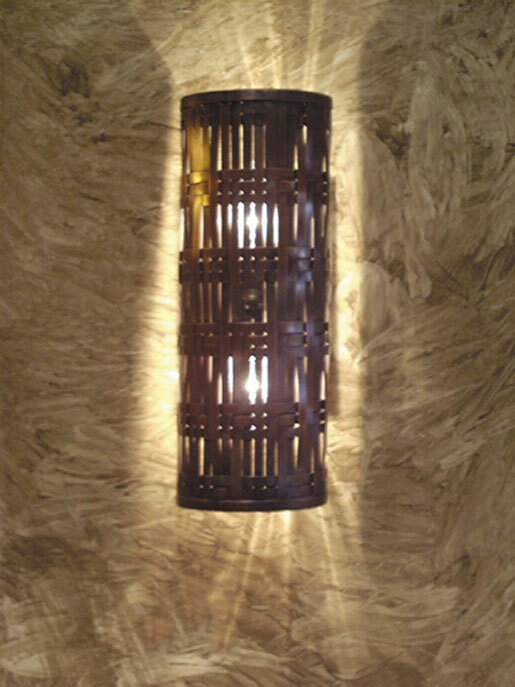 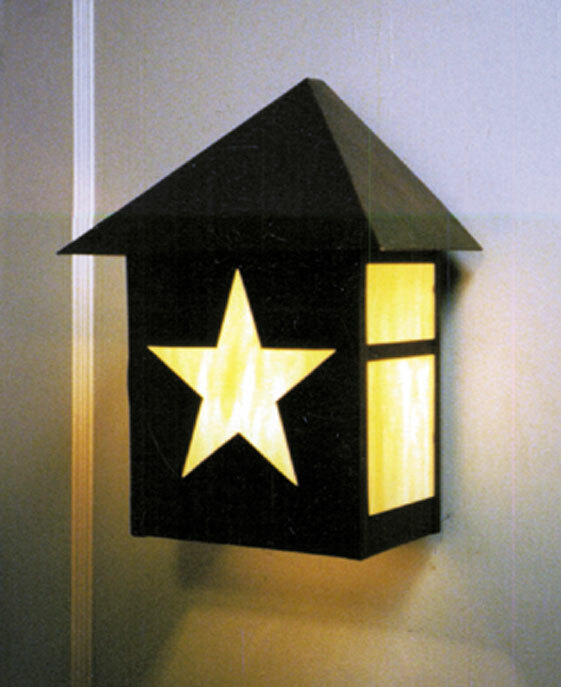 A hand made piece designed to provide an economical, yet attractive option for a commercial or residential setting. 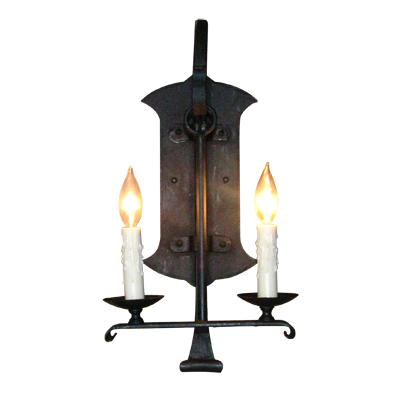 Custom wrought iron wall sconce with faux candlesticks and candelabra bulbs. 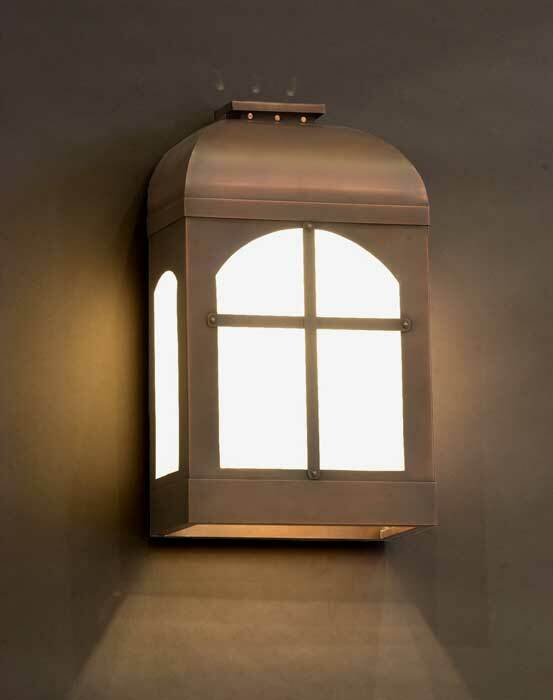 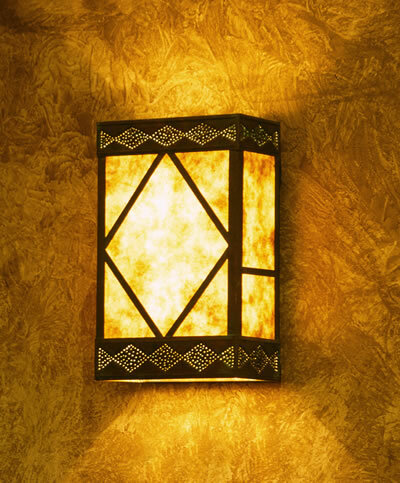 Hanging lantern combines both traditional and modern styles to produce a slender and elegant piece. 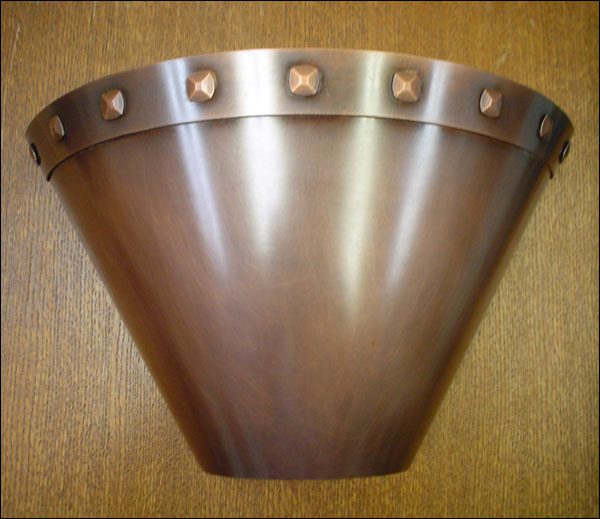 Medium copper, clear glass diffuser. 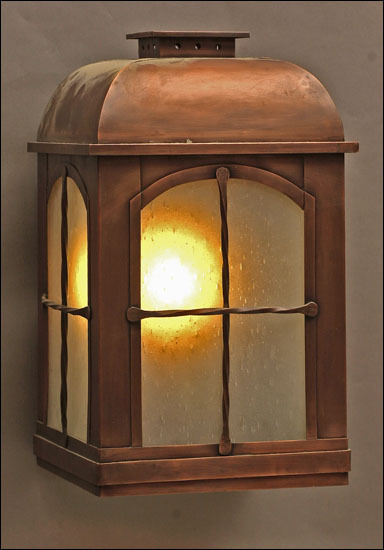 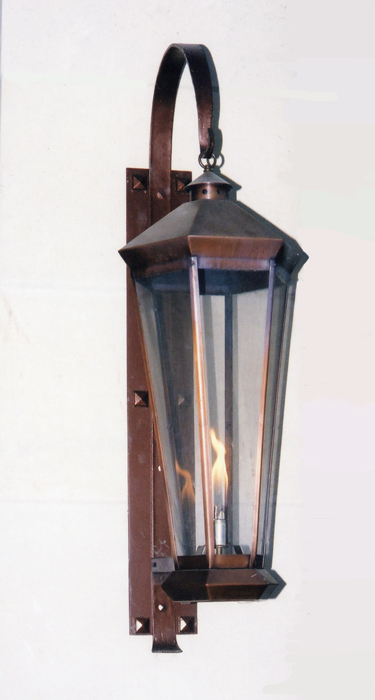 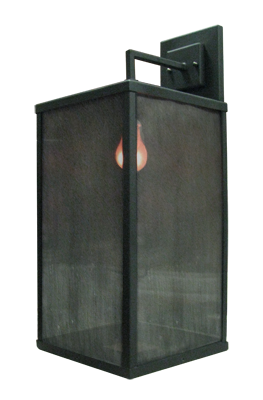 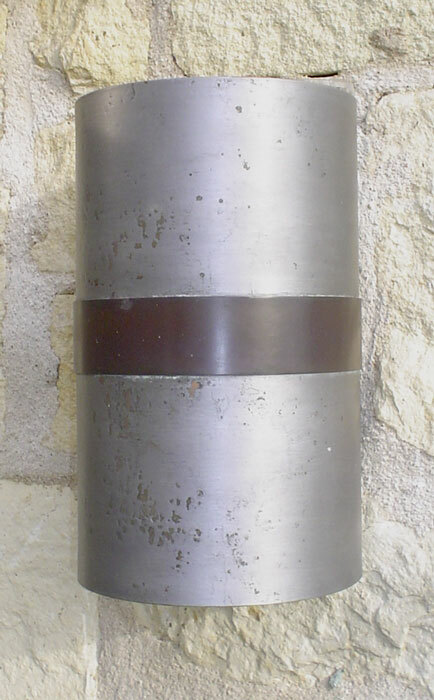 Shown as a gas lantern; also available as an electric fixture. 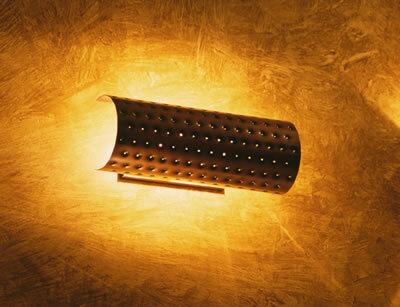 Designed to fit in the right angle corner of a room, this hand crafted sconce employs a simple band of hand punching bordered by raised beads. 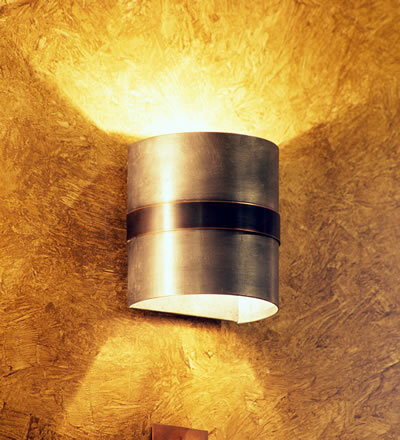 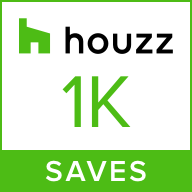 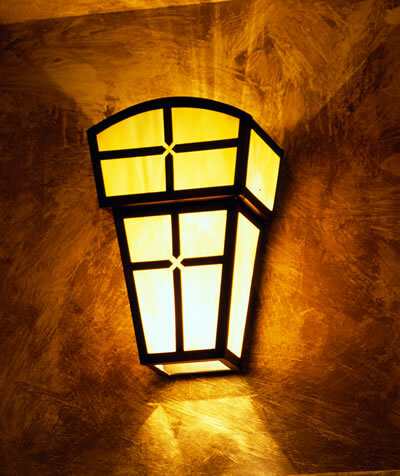 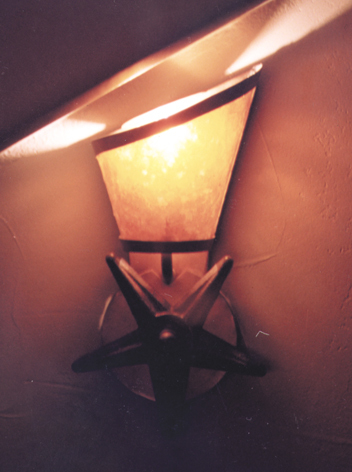 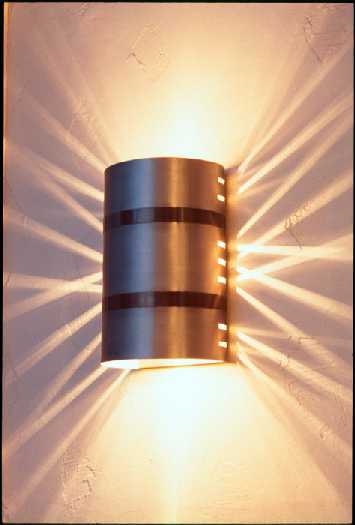 A wall sconce design that lends itself for use in pairs with a right and left hand version. 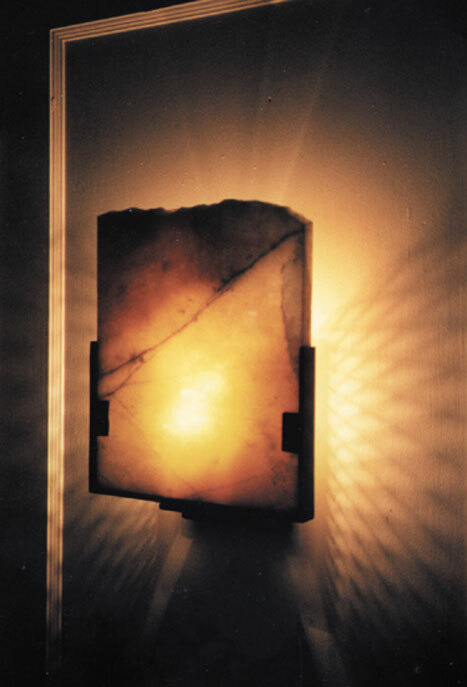 Shown with amber mica. 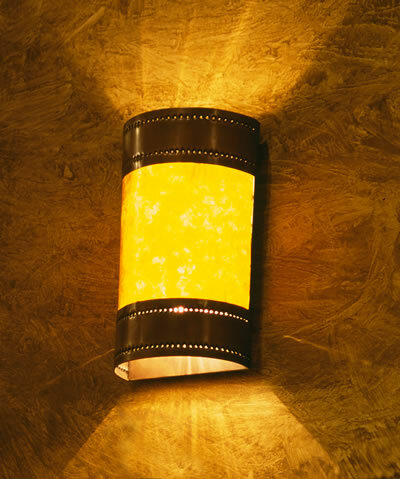 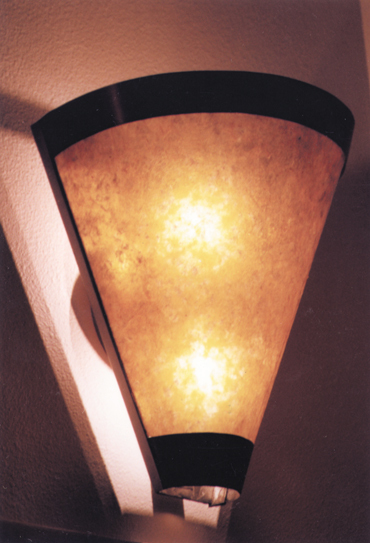 A metal star sconce, with a diffuser (shown with amber mica) contributes to the simply attractive functionality of this sconce. 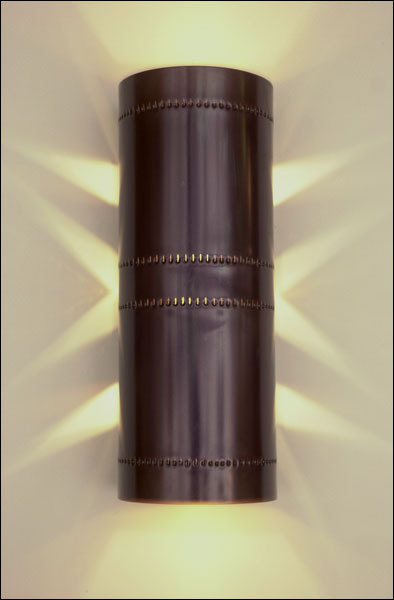 A simple partial cone hovering off the wall slightly allows light to flood 360° around as well as through the diffuser.